Cupid Childs didn’t get his nickname because he was born on Valentine’s Day. This is Extra Mustard’s Dead Dead Ball Ballplayer of the Week, a new feature we’ll have every week (back now after a Super Bowl hiatus) to help you get through the baseball off-season. Cupid Childs didn’t get his nickname because he was born on Valentine’s Day. Born Clarence Lemuel Childs, Cupid’s nickname stemmed from his cherubic appearance. The pudgy second baseman was listed at 5'8", 185 pounds, which was apparently chubby enough for a female spectator to quip “What a funny little fat man,” when Childs came to the plate. Showing them he was anxious for a trial he was told to go to the grounds and practice with the rest of the team. A search was made for a uniform that would fit him, but none could be found, the only thing of that nature large enough for him being a pair of divided skirts, which he put on, cutting them off at the knees. His appearance with this costume on can be imagined and was so ludicrous that it threatened to break up the practice. However, as soon as he got out on the diamond and began to practice they began to open eyes and wonder. 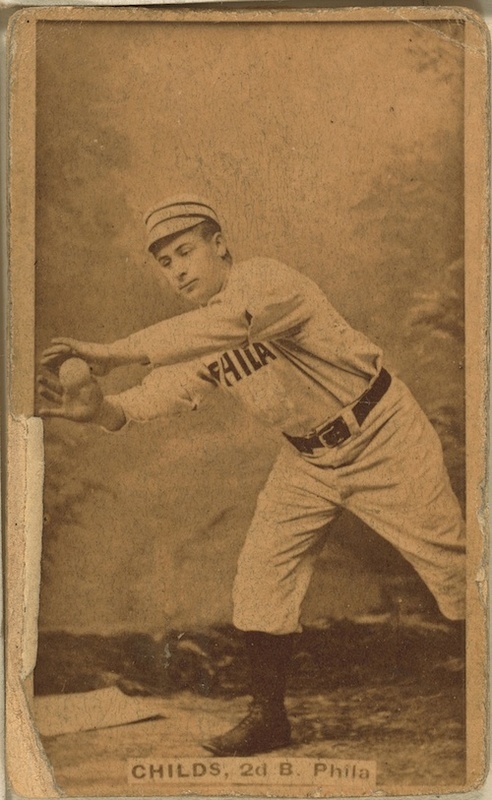 Childs was a pudgy second baseman who debuted with the Philadelphia Quakers in 1888 at age 20, playing two games. He moved to the Syracuse Stars in the following year and returned to the majors when the Stars left the International League for the American Association in 1890. In 1891, Childs signed with the Cleveland Spiders, where he played the next eight seasons and established himself as a good hitter and, despite his physique, an adept fielder. “National League opponents found nothing funny or bizarre about the bare-handed dexterity with which Childs and McKean dispatched them by turning the double play, applying the hard tag at second or holding onto a runner’s belt when the game’s lone umpire wasn’t looking,” Blevins wrote. Cupid’s Cleveland career ended in 1898 and he concluded his major-league career with three sub-par seasons with the St. Louis Perfectos and Chicago Orphans (now known as the Cardinals and Cubs). He played three more seasons with a variety of minor-league clubs before hanging up his cleats at age 36. After retiring, Cupid returned to his native Baltimore and by the time he was 45 he had fallen quite ill. A 1912 item in The Pittsburgh Press said Childs was hospitalized with cirrhosis of the liver and “Bright’s disease,” an antiquated term for a variety of kidney ailments. The article, dated Nov. 4, said Childs “can live but a short time.” He died on Nov. 8.